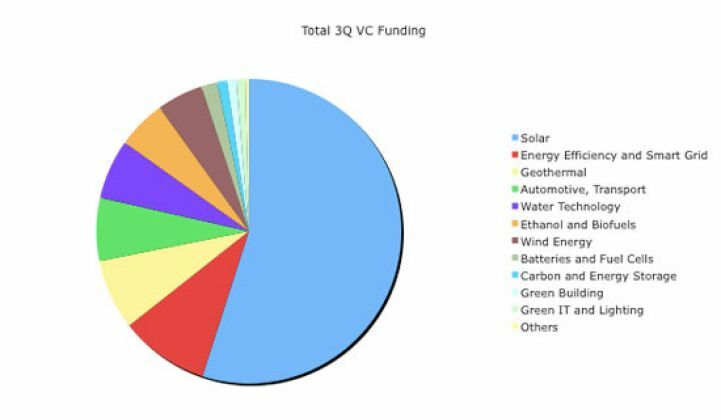 Greentech startups raised $2.8 billion in venture capital in the third quarter, more than double the second-quarter total, with solar companies raking in $1.5 billion. Venture capitalists invested a record $2.8 billion in greentech in the third quarter, according to a Greentech Media report scheduled for release Wednesday. It's the largest quarterly total since the Venture Power Report began tracking renewable-energy deals in 2004, according to the report. The amount is more than double the $1.3 billion total for the second quarter, which was the previous record quarter, and brings total VC investments in greentech so far this year to a whopping $5.09 billion. That represents a 49.7 percent increase from the full year of deals last year – which amounted to $3.4 billion, according to Greentech Media – and there's still a quarter to go. 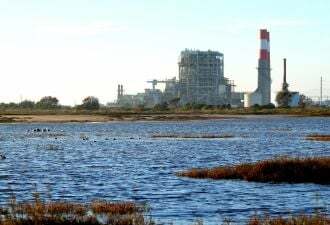 Eric Wesoff, a senior analyst at Greentech Media, said in the announcement that he expects the strong activity to continue through the fourth quarter and next year. Solar companies raked in the most cash, raising $1.5 billion in the third quarter. The quarterly sum exceeded the $1.05 billion total that the Venture Power reported for solar investments in the whole of last year. "Every niche in solar is being explored," Wesoff said in a written statement. 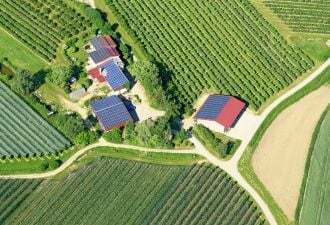 "Investors remain bullish on every aspect of the solar sector." The solar cash was spread over 26 rounds. That means companies closed much larger deals, as last year's $1.05 billion came from 71 rounds. Several solar firms, including SoloPower and AVA Solar, closed rounds of more than $100 million, the report noted. Nanosolar also confirmed a $300 million equity round in August. As solar companies grow capacity, larger-sized investments are "simply the price to play in this game," Wesoff said in an interview Tuesday. "Every public firm, [whether it's] SunPower or Suntech or Evergreen, has to invest similar amounts to build and grow their capacity. Those magnitudes don't change just because these startups are doing it." Solar is a more explored and popular investment sector than other areas with larger markets, such as batteries, because the solar market is growing rapidly – more than 30 percent per year – and because the potential for innovation and cost reduction is evident, he said. Also, he added, "there have been some successful solar IPOs and VCs love IPOs." He points to wind power as an example, saying that it is also not receiving as much VC investment – in spite of its larger market – partly because the large size of the projects results in less of an opportunity for startup innovation. "Other than perhaps 'small wind,' it's a difficult place for startups to play," he said. But other sectors also received record amounts of funding. Transportation companies received $193 million, according to the report. Energy-efficiency, demand-response and smart-grid companies, which were lumped together, raised $272.1 million. And biofuel investments also remained strong, garnering more than $150 million. Wesoff said investors expect to see a series of greentech exits – IPOs and acquisitions – in 2009 and 2010. "Despite less than optimal market conditions, there are a number of renewable-energy IPOs filed and on deck," he said.